360 Yield Center seeks to push corn yields consistently to 300 bushels per acre, and beyond, through better management and application of water and nitrogen. Is 500-bushel corn really attainable? Those involved with the new Illinois-based company 360 Yield Center think so, through better identification and management of limiting factors in the field. The cornerstones of the company’s “sense, decide and apply” mantra are better analysis and application of nitrogen and water in cropping systems. At a recent field event held at company founder Gregg Sauder’s home farm in Tremont, Ill., Sauder said better management of water and nitrogen are the biggest targets to grow U.S. corn yields by an average 80 bushels per acre, compared to current practices. The landscape for prescription farming-based programs is becoming increasingly crowded, with several companies, including Monsanto and DuPont Pioneer, having launched services in the last few years, with varying degrees of success. 360 Yield Center actually changed its name from Yield360 to avoid confusion with Pioneer’s Field360 prescriptive-farming platform. What distinguishes 360 Yield Center from the competition is proven experience in yield improvement, says Daryl Starr, who heads up the company’s 360 Commander, a decision-aide software tool he developed in 2008. The focal point of the system is 360 Commander. The program provides customized information based on variables such as soil content, seed selected and daily local weather that has occurred and is forecasted. A component of 360 Commander is Yield Solver, software which monitors local environmental and field changes hourly, and analyzes possible combinations of environment, seed, nitrogen and irrigation rates for optimal field-specific yield. Starr says he’s noticed a lack of accuracy with nitrogen and water management by farmers and their advisors, causing farmers to keep missing the mark to capture yield potential. “So many times with our crop-consulting business I’d be standing out in the field with a farmer asking me about some magic dust that’s going to save his crop and I’d tell him, ‘You just had 6 inches of rain. I guarantee you’re going to have nitrogen deficiency right now,’” Starr says. “It was a simple answer, even though the farmer didn’t like it. It’s going to cost you $50 an acre and some hassle, but I can make you 80 bushels per acre if you do something about this. For $7.50 per acre, farmers can subscribe to 360 Commander and receive prescriptions for variable-rate seeding, nitrogen application and scheduling plans for both sub-drip and pivot irrigation. Starr says these prescriptions help counteract the plant’s stress points that are limiting yield. But in order to provide reliable in-field prescriptions — especially for nitrogen and water — accurate testing and application tools are needed, Starr says. 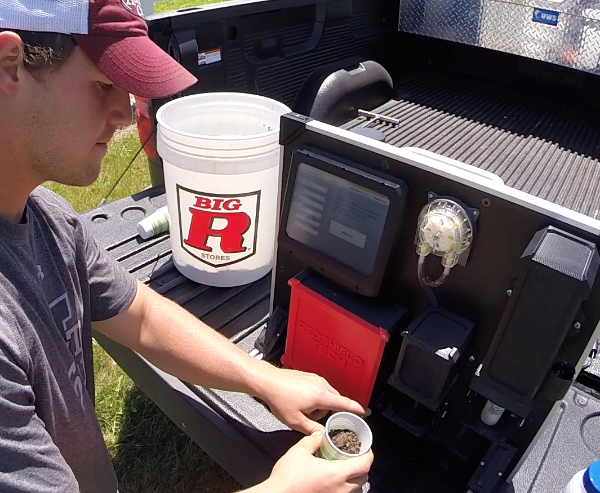 The inclusion of 360 SoilSCAN — a mobile soil-testing unit which retails for about $6,500 — provides a 5-minute analysis of soil nutrients, including in-field nitrate readings and customized variable-rate prescriptions for nitrogen, water, phosphorus and ammonia, which are linked to the 360 Commander program. Another part of the equation is the 360 Y-Drop, an attachment mounted on sprayer booms to apply in-crop nitrogen at the base of corn stalks up to 6 feet tall, based on plant need. The high-clearance units hang down between rows to deliver fertilizer through Y-shaped hoses at the base of the plants. According to Starr, it costs about $17,500 to equip a 60-foot bar with the 360 Y-Drop system. 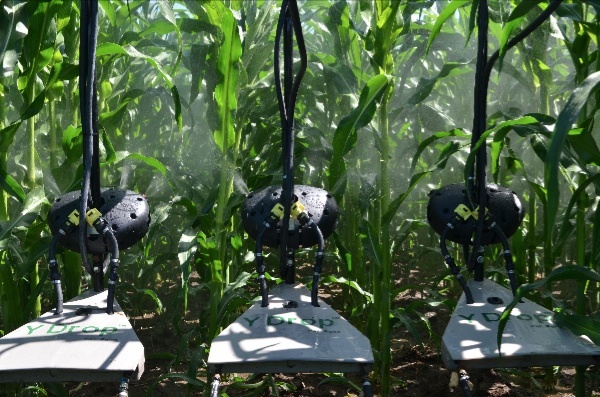 An attachment to the Y-Drop units is the 360 UnderCOVER spray applicator that can apply fungicides, insecticides or other nutrients underneath the canopy of corn plants, spraying up toward the bottom of leaves. Another distinction Starr sees from the competition is that 360 Yield Center isn’t a seed company. Starr says in the coming years, company focus will be on improving accuracy to the point that it’s program can provide a plant-by-plant analysis to incorporate into a farmer’s prescription. But it’s going to take time and adoption by farmers.